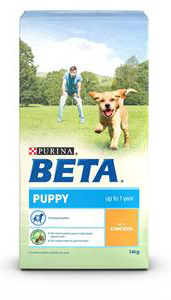 There is a fairly comprehensive range of products under the Beta brand, and some pretty packaging, but if you are looking for either a basic dog food or something a little more 'natural' then there's not a lot to recommend here as prices are high compared with similar foods in pet shops. Purina are a huge US feed company and specialise in Soya concentrates. Beta is typical of many very basic recipes based around animal and vegetable derivatives together with unnamed cereals, except that it is far more expensive than others. Even the 'Sensitive' food does not follow the norm with named meat and cereals in case your dog has an intolerance to, say, rice or wheat. 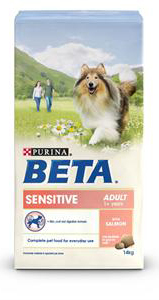 You would have no idea with the Beta Sensitive as to which cereal you were feeding. Expect to pay upwards of £36 / 14kg which is a lot more expensive than some more natural foods. Nothing really to recommend Beta. Cereals (wholegrain 20%), Meat and animal derivatives (meat 14%, chicken 4%), Vegetable protein extracts, Oils and fats, Derivatives of vegetable origin (dried beet pulp 1.1%), Vegetables (dried chicory root 1.1%), Minerals. Vit A: 22 600; Vit D3: 1 300; Vit E: 170; mg/kg: Fe (E1): 94; I (E2): 2.3; Cu (E4): 10; Mn (E5): 7.1; Zn (E6): 175; Se (E8): 0.23; Vit C: 140. With antioxidants. Cereals (min. 4% Rice), Meat and Animal Derivatives (min. 14% Meats), Vegetables Protein Extracts, Oils and Fats, Derivatives of Vegetable Origin (min. 0.5% Beet Pulp), Fish and Fish Derivatives ( min. 4% Salmon ), Minerals, Vegetables (min. 0.5% Chicory).